If you’re a Respiratory Therapy student that is looking for Myasthenia Gravis practice questions then you’ve come to the right place. 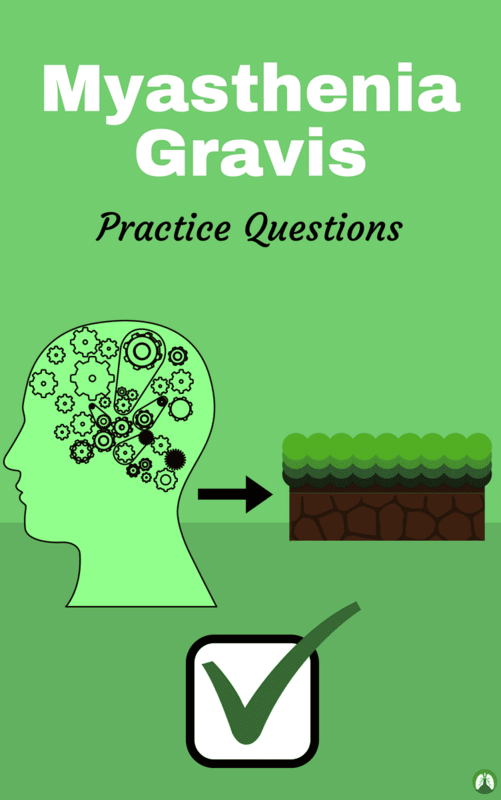 As you will see, we put together this awesome study guide that is loaded with practice questions that will teach you everything you need to know about Myasthenia Gravis. As a Respiratory Therapist, this is a disease that you will definitely need to be familiar with. You will most definitely see patients with Myasthenia Gravis and you will need to know how to treat them effectively. Not to mention, you will see questions on this topic on your board exam as well. The good news it, this study guide can help you learn what you need to know. So are you ready to get started? 1. What is myasthenia gravis? It is a chronic disorder of the neuromuscular junction which interferes with the chemical transmission of acetylcholine (ACh) between the axonal terminal and the receptor sites of voluntary muscles characterized by weakness and rapid fatigue of any of the muscles under your voluntary control. Myasthenia gravis means grave muscle weakness. 2. What causes myasthenia gravis? A breakdown in the normal communication between nerves and muscles due to ACh receptor (AChR) antibodies (IgG antibodies) that block the nerve impulse transmissions at the neuromuscular junction. 3. What is the hallmark clinical feature of myasthenia gravis? Fluctuating skeletal muscle weakness, often with true muscle fatigue. 4. As respiratory therapists, how do we remember myasthenia gravis? It is a descending disorder. You can remember it by using the first letter, ‘M’ and ‘G’, because the disease goes from the ‘mind’ to the ground. 5. What are two clinical types of myasthenia gravis? 6. What is ocular myasthenia gravis? A type of myasthenia gravis where muscle weakness is limited to the eyelids and extraocular muscles. 7. What form of myasthenia gravis manifest muscle weakness involving a variable combination of muscles of the mouth and throat which is responsible for speech and swallowing (called bulbar muscles), limbs, and respiratory muscles? 8. How will the generalized myasthenia gravis patient appear if facial muscles are involved? 9. What form of myasthenia gravis may, or may not, involves the ocular muscle? 10. How may myasthenia gravis associated with abnormal weakness manifest itself? It may be confined to an isolated group of muscles (e.g., the drooping of one or both eyelids), or it may manifest as a generalized weakness that in severe cases includes the diaphragm. 11. What is a “myasthenic crisis”? It is a complication of myasthenia gravis characterized by worsening of muscle weakness, resulting in respiratory failure that requires intubation and mechanical ventilation. When the diaphragm is involved, ventilatory failure can develop. 12. What is the etiology of myasthenia gravis? It is related to circulating antibodies of the autoimmune system. This disease is provoked by emotional upset, physical stress, exposure to extreme temperature changes, pregnancy and febrile illness. 13. What is the past medical history of myasthenia gravis patients? Gradual onset of weakness and may have previous admissions for myasthenia gravis. 14. What is the physical appearance of patients with myasthenia gravis? General weakness that improves with rest, drooping eyelids (ptosis), double vision (diplopia), and dysphasia. 15. What is the respiratory pattern seen in myasthenia gravis patients? 16. What breath sounds are seen in myasthenia gravis patients? 17. What are the special tests for myasthenia gravis? Edrophonium (Tensilon) Challenge Test, electromyography, blood test for Ach Receptor Antibodies, and Ice Pack Test. 18. What spontaneous ventilatory parameters are seen with myasthenia gravis? Decreasing Vt, VC, and MIP. 19. What pulmonary function can be seen with myasthenia gravis? 20. What should be done if the Vt, VC, MIP, and weakness improves with Tensilon? Maintain drug therapy anticholinesterase therapy, cholinesterase inhibitors) including Neostigmine (Prostigmin) and Pyridostigmine (Mestinon, Regonol). 21. What should be done if the Vt, VC, MIP, and weakness worsens with Tensilon? Administer atropine to reverse Tensilon. 22. What is the treatment for myasthenia gravis? Closely monitor Vt, VC, and MIP. Intubate and institute mechanical ventilation when indicated. Bedrest restriction and soft diet to reduce symptoms, oxygen therapy for hypoxemia and pulmonary hygiene. Other treatment modalities include corticosteroids in severe cases, thymectomy, and plasmapheresis. 23. What is the usual peak age of myasthenia gravis onset? In females between 15 to 35 years old and between 40 to 70 years old in males. 24. When is death caused by myasthenia gravis possible? During the first few years after onset. 25. What are the screening methods and tests used to diagnose myasthenia gravis? Clinical presentation and history; bedside tests; immunologic studies; electrodiagnostic studies; and, evaluation of conditions associated with myasthenia gravis. 26. What is a generalized characteristic of myasthenia gravis? The muscles become progressively weaker during periods of activity and improve after periods of rest. 27. What are the signs and symptoms of myasthenia gravis? Facial muscle weakness; ptosis (drooping of one or both eyelids); diplopia (double vision); ophthalmoplegia (paralysis or weakness of one or more of the muscles that control eye movement); difficulty in breathing, speaking, chewing, and swallowing; unstable gait; and, weakness in arms, hands, fingers, legs, and neck brought on by repetitive motions. 28. What are especially susceptible and are usually affected first in myasthenia gravis? The muscles that control the eyes, eyelids, face, and throat. 29. What can become weak and impair patients’ ventilation in myasthenia gravis? The respiratory muscles of the diaphragm and chest wall. 30. What will impairment in deep breathing and coughing predispose the patient to? Excessive bronchial secretions, atelectasis, and pneumonia. 31. What are the characteristics of the signs and symptoms of myasthenia gravis during the early stages? 32. What are the characteristics of myasthenia gravis onset? Subtle, intermittent, or sudden and rapid. 33. How is the direction of paralysis in myasthenia gravis characterized? 34. How may the myasthenia gravis patients’ health status be presented? Demonstrate normal health for weeks or months at a time. 35. When do myasthenia gravis patients show signs of weakness? Late in the day or evening. 36. What is an important sign and symptom for the respiratory therapist to be aware of in myasthenia gravis and why? Development of a sudden and transient generalized weakness that includes the diaphragm and ventilatory failure. 37. What is the first noticeable symptom in most cases? Weakness of the eye muscles (droopy eyelids) and a change in the patients’ facial expressions. 38. Where can weakness develop as myasthenia gravis becomes more generalized? 39. Where is muscle weakness usually more pronounced with myasthenia gravis? In the proximal parts of the extremities. 40. What is the ice pack test? A very simple, safe, and reliable procedure for diagnosing myasthenia gravis in patients who have ptosis (droopy eye). 41. What is the advantage of using the ice pack test in myasthenia gravis? Does not require special medications or expensive equipment and is free of adverse effects. 42. What does the ice pack test consist of? The application of an ice pack to the patients’ symptomatic eye for 3 to 5 minutes. 43. When can tests be considered positive for myasthenia gravis? If there is an improvement of the ptosis (an increase of at least 2 mm in the palpebral fissure from before to after the test). 44. What is a major disadvantage of the ice pack test? It is useful only when ptosis is present. Drooping of one or both eyelid. Paralysis or weakness of one or more of the muscles that control eye movement. 48. What difficulties may be shown in a myasthenia gravis patients’ clinical history? Breathing, speaking, chewing, and swallowing. 49. What kind of gait is manifested by myasthenia gravis patients? 50. What can be brought on by repetitive motions in myasthenia gravis patients? Weakness in arms, hands, fingers, legs, and neck. 51. Why is the reliability of the ice pack test in patients with diplopia without ptosis is usually questionable? Because the patients’ personal impression of the diplopia is subjective. 52. What should be considered when the reliability of the ice pack test in patients with diplopia without ptosis is usually questionable? Caution should be exercised in patients with isolated diplopia without ptosis. 53. What patients will the ice pack test may be especially useful? Patients where edrophonium test is contraindicated by either cardiac status or age. 54. When is the edrophonium (Tensilon) test used? In patients with obvious ptosis or ophthalmoparesis. 55. What is a short-acting drug, blocks cholinesterase from breaking down ACh after it has been released from the terminal axon that increases the myoneural concentration of ACh, which in turn offsets the influx of antibodies at the neuromuscular junction? 56. What can occur when muscular weakness is caused by myasthenia gravis and edrophonium is used? A dramatic transitory improvement in muscle function (lasting about 10 minutes) is seen. 57. What is a disadvantage of the edrophonium test? That it can be complicated by cholinergic side effects that include cardiac arrhythmias and cardiopulmonary arrest. 58. What neurotransmitter is associated with myasthenia gravis? Acetylcholine receptor antibodies destroy Ach receptors which prevent the transmission of muscle actions. 59. What age and gender does myasthenia gravis affects most often? Women under 40 and men over 60. 60. What is the rate of progression of myasthenia gravis? 61. What are the initial signs and symptoms of myasthenia gravis? Double vision, swallowing problems and eye face musculature first. 62. What is neonatal myasthenia? Happens when a woman gives birth, antibodies come from the mothers’ bloodstream and affect the child who may have muscle weakness. 65. How is myasthenia gravis diagnosed? Physical test: reveals easy fatigability; Blood test: tests for antibodies against acetylcholine receptor; Ice test: put on the eyelid to see if the droop contracts, the antibody of ACh are blocked, where the ice pack is applied, it shows muscle improvement; and, Spirometry: lung functions. 66. What is the goal of medical treatment for myasthenia gravis? 67. What are the four common medical interventions for myasthenia gravis? Medications: ACh inhibitors/steroids; Surgery: thymectomy; IVIG: intravenous immune globulin, immune system booster: and, Plasmapheresis: filters things out of your bloodstream (effective but temporary). 68. What are the remedial tasks for myasthenia gravis? Remedying muscle weakness and endurance, activities that are going to gradually increase endurance over time. 69. What are the challenges experienced with myasthenia gravis? Muscle weakness and fatigue and cognitive problems from fatigue. 70. What is the difference between ALS and myasthenia gravis? Myasthenia gravis is not progressive while ALS is. 71. What patient demographic does cardiac monitoring, or avoiding Edrophonium (Tensilon) Test is suggested? The elderly or those with a history of arrhythmia or heart disease. 72. What is associated with the Tensilon Test even though the sensitivity of it in the diagnosis of myasthenia gravis is in the 80% to 90% range? It is associated with many false-negative and false-positive results. 73. What may be found in a physical examination of myasthenia gravis patients? Adverse respiratory rate, cyanosis (in severe cases), and chest assessments. 74. How does respiratory rate vary in myasthenia gravis patients? Depends on the degree of respiratory muscle paralysis, moderate to severe myasthenia gravis, and ABG presents how elevated PaCO2 and HCO3 (which is normal) all else decreased. 75. What is the FVC value for impending acute ventilatory failure related to myasthenia gravis? 76. What is the MIF value for impending acute ventilatory failure related to myasthenia gravis? < -30 mc H2O (NIF). 77. What is the MEP value for impending acute ventilatory failure related myasthenia gravis? 78. What is the PaCO2 value for impending acute ventilatory failure related to myasthenia gravis? 79. What is the FVC value for impending acute ventilatory failure related to myasthenia gravis? 80. What are the basic therapy modalities for myasthenia gravis? Acetylcholinesterase inhibitors, Immunotherapy, rapid immunotherapies, thymectomy, and the avoidance of drugs that may exacerbate myasthenia. 81. What could occur if the myasthenia gravis patient is not properly managed? Mucous accumulation with airway obstruction, alveolar consolidation, and atelectasis may develop. Now that you’ve gone through all of these Myasthenia Gravis practice questions, how do you feel about this disease? Do you have a good understanding of it? If not, no worries! It’s definitely a lot of information to consume. Just remember, repetition is the key. You can use this study guide to go through the information again and again until it stick. Your future Respiratory Therapist self will thank you for it. Thanks for reading and as always, breathe easy my friend.